Dunn Meadow Concierge is a personalized service that offers patients and physician offices the answers to any questions they have. Dunn Meadow goes beyond your typical pharmacy. We ensure you get started on your therapy as quickly as possible by providing benefits investigation, prior authorization support, and financial assistance programs. We are on call 24/7 to meet your needs. Your Concierge will guide you through every step of the prescription process. From status updates to well-being consultations, you have a single point of contact for all of your pharmacy needs. Your Concierge will provide personal refill reminders to ensure no gaps in therapy. What Our Patients Say About Us"Hello Jessica, I wanted to take a moment to just say thank you! Truly ever since I started using Dunn Meadow, I have not had to worry about any of my medications and having that one less thing to worry about is a blessing you have no idea! Thank you so much for making my life just a little less worrisome!" What Our Patients Say About Us"Amy, Just a few words to express my appreciation for you going above and beyond for all of the help that you have provided for me. It has been helpful beyond what you could ever imagine. Many thanks. " 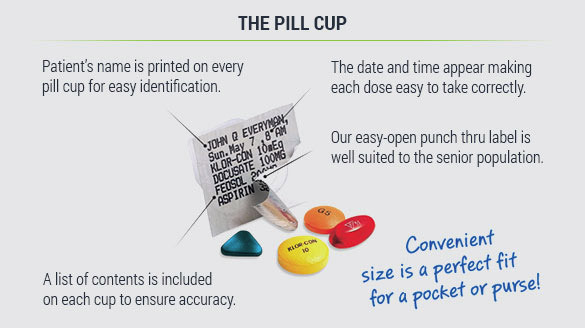 We offer a simple, color coded blister-pack for patients on complex regimens to improve adherence and accuracy in medication management.